As a bass or guitar effect, the fuzz circuit on it’s own does a poor job of reproducing the attack and decay dynamics that would normally result when a musician varies the way they hit the strings (playing harder or softer) because of the compression created by the clipping diodes in the fuzz circuit. 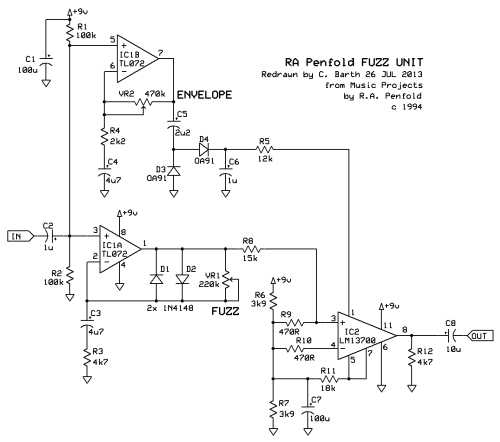 But, when fed through the VCA controlled by the parallel gain stage, the VCA tracks the player’s dynamics and, as a result, the output volume of the fuzz follows the original attack and decay characteristics of whatever instrument is connected to the input. My initial impression is that this circuit performs pretty much as promised. It also seems to work quite nicely as a noise gate. The VCA is based on the LM13700, and is not simply lifted from the LM13700 datasheet. The VCA does seem to add some filtering to whatever is fed through it. For example, if you watched and listened to the above video, you might notice that the fuzz sounds a little different going through the VCA compared to when the VCA is bypassed. At any rate, I think it’s an interesting circuit that could have some cool applications other than what was originally intended. This entry was posted in Envelope Filter, Fuzz Distortion Overdrive, Modulation and tagged dynamics, envelope control, noise gate, VCA by charlie. Bookmark the permalink. Nice idea! That’s something I always wanted to try with the fuzz unit. You beat me to the punch! This is cool mate! I have been looking for a side chain pumping effect on the cheap. Where do you wire the jack for the gate input? Are d1 d2 and the pot in the fuzz section replaced by this? Let’s see if I can remember… after doing this about 3 years ago! I think I removed everything before R5 and everything before R8. Then the gate signal goes to R5 and the signal input goes to R8. I might have adjusted the values of R5 and R8 and maybe added some pull down resistors too, I don’t remember exactly. So at the end of the video, I think the atari punk console was plugged into R8 and the drum machine was plugged into R5. YMMV. Cheers!